What makes the best firewood? One of the most common questions I get asked is "What is the best firewood?" or similarly "Is such-and-such any good as firewood?". This page is an attempt to address the question, as well as providing specifics on some of the woods I've been lucky enough to burn. To start with we need to quickly consider what is happening in a stove; regardless of what type of firewood you are burning it is heated up to the point where it's structure breaks down into a gas. This gas is what actually mixes with the oxygen and burns to give off heat. Some types of firewood have more volatile oils in them which evaporate quickly to begin with and give a good burst of heat as they burn. Typically these are pines or eucalyptus trees and have a strong and distinctive resinous aroma. Once these oils are burnt off all that is left is the cellulose and lignin that makes up the "bones" of the tree. Lignin is the same molecule in all types of wood and as it is heated it vaporises and burns. Basically, what ever fuel you are burning, one kilogram of dry wood has the same heat energy as any other firewood type. 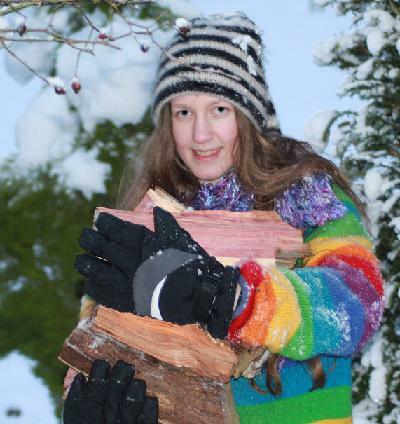 The missus bringing in some firewood in the middle of winter. This is Yew wood, seasoned for over 8 years! These logs were dumped off the ground and under cover and forgotten by the previous owner of the property and forgotten about. They burn hot and long and leave an excellent bed of coals. Brilliant for a chilly evening. So you are saying all types of firewood are the same? Well, yes, up to a point. The differences come about because not all trees have the same density. When dry 1kg of poplar might be 3 or 4 decent sized splits of wood, the same weight of oak might only be one single split. Over an evening you'll burn the same mass of wood to keep you house warm but you might need to load your stove four times as often! If you think that sounds like hard work you'd be right. If you are harvesting your own and just cutting wood from your own wood lot then you won't have much choice. However, if you are buying your wood it is usually worth specifying species if you have a choice - you can be assured of what you are buying and with experience will get to know how much wood you get through in a season. If you have a choice of fuel try to pick denser woods. Oak is pretty much the best wood we can reliably get here in the UK but it takes an age to season. In the US the gold standard seems to be black locust or osage orange. Woods to avoid are those which are less dense when dry. You can't always tell with fresh cut timber as the water in the wood is very heavy. Here we sometimes cut poplar and regularly cut sweet chestnut. When fresh cut similar sized logs are about the same weight but when seasoned the poplar feels like a piece of cotton wool by comparison. These guys have produced a great chart of different firewood species with their BTU values per cord. At it's simplest high BTU values are better. If you can stick to wood from the top half of that chart you're doing well. Having covered the basics there are plenty of other variables that make some woods better than others for specific purposes, or in special circumstances. large parts of the USA and Canada have access to vast pine forests and not much else. light weight or resinous woods can make the best kindling as they catch more easily. If your favourite firewood type isn't listed you can add it by filling in the comments page below. Do you burn a particular firewood type that we don't have? Or have we got something wrong? Share your wood burning stories! Enter Your Title - What type of firewood or tree species do you want to talk about? Do you have some pictures or graphics to add? Pictures really help readers identify tree types - if you have a photo to share, great! Click the button and find the first one on your computer. Select it and click on the button to choose it.